Gostlin's custom-built 10,000-square-foot lodge includes a massage area, wine cellar, game room, hot tub and wood-fired sauna. If you're going to dream, dream big. That's exactly what Canadian ski guide Jeff Gostlin did not long ago. With a vision that's been rolling around in his head, finding the right partners and some negotiating, Gostlin Keefer Lake Lodge Catskiing was born. I had the opportunity to visit Jeff and his newly formed catskiing operation last January, when his lodge was in mid-construction and roads were being cut and terrain prepared for this season's operation. Gostlin Keefer Lake Lodge sits in British Columbia's iconic Monashee Mountains, which are known for incredible snowfall. Getting there from Spokane/Coeur d'Alene is approximately a seven-hour drive. 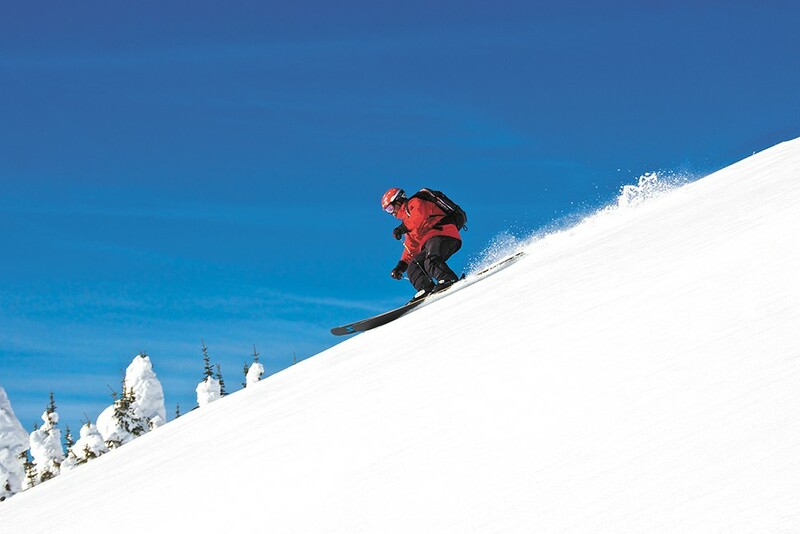 The lodge, which sits between Nakusp and Kelowna, is one of the few catskiing lodges you can actually drive to. With a few of my powder-skiing-junkie friends, I spent a few days with Jeff as he guided us around his new playground which surrounds the lodge. Growing up in nearby Kelowna, Jeff's family had a ski condo at nearby Big White Ski Resort, where he spent many winter days sliding around the hill with family and friends, perfecting his ski skills. It didn't take long for Jeff's father to see his son's passion — make that obsession — with skiing. His father brought Jeff along on a catskiing powder trip at an early age. That's when things changed. "I got a passion for catskiing as a kid; growing up, my dad took me as a guest, and I saw what the guides got to do every day," says Jeff. "From that time, I decided guiding is what I wanted to pursue." That was more than 25 years ago, and with countless hours of training and certifications through the Association of Canadian Mountain Guides, Jeff has worked for the past 15 years in the tight-knit catskiing industry as a guide. After years of traveling throughout the Kootenays and Selkirks, working with numerous operations, he wanted to branch out on his own. Through years in the business, he knew there was a solid market for catskiing, and most trips are booked out a year in advance. Now was the time; he just needed to find a location. Jeff was working as a heli ski guide when he learned about the old fishing lodge which sat on the shores of Keefer Lake, a small lake recognized for incredible trout fishing. "I was guiding with Kingfisher Heliskiing, and they introduced me to this area which was for sale," he says. "It was mostly a fishing lodge; they did a little bit of hunting and camping and RVing, but it was mostly a summer lodge. We looked into buying it, but we had to play with the tenure a little bit to make it available for catskiing and heliskiing. We got the tenure [the permission to operate], worked out a deal with the previous owners and bought the property." It didn't take long for Jeff to get this ball rolling — after all, it had been on his mind for a long time: "This was always a dream I'd been thinking about, and this lodge has been a design that's been floating around in my head for over 10 years." In the summer of 2015, Jeff's dream lodge was becoming a reality, going from blueprints to breaking ground. After a year and half of concrete, sawdust and many long days, the Gostlin Keefer Lake Lodge has just about come to fruition, as Jeff opens the doors for his first catskiing clients this December. This 10,000-square-foot, custom-built, timber-frame structure is a handcrafted masterpiece, filled with intricate details and all of the finest amenities, including a comfortable lounge, custom-built bar, a dining area for 20 people and a glass elevator that runs through the lodge, whisking riders with tired legs up and down the four floors. In the lower level there's a drying room, a massage area, wine cellar, game room, hot tub and wood-fired sauna. The top level is the guest quarters, with nine finely appointed rooms. The culinary team led by Chef Len Cloutier creates unique dishes using globally inspired menus and local produce and meats. I know firsthand of Chef Len's craft; on my trip, he was cooking for the construction workers every day, and I brought up some elk steaks for the work crew and our team. Chef Len hit one out of the park with his rendition of elk Bourguignon. The food and lodge are spectacular, but let's face it — serious powder riders come to the Monashees for the riding and the snow quality. 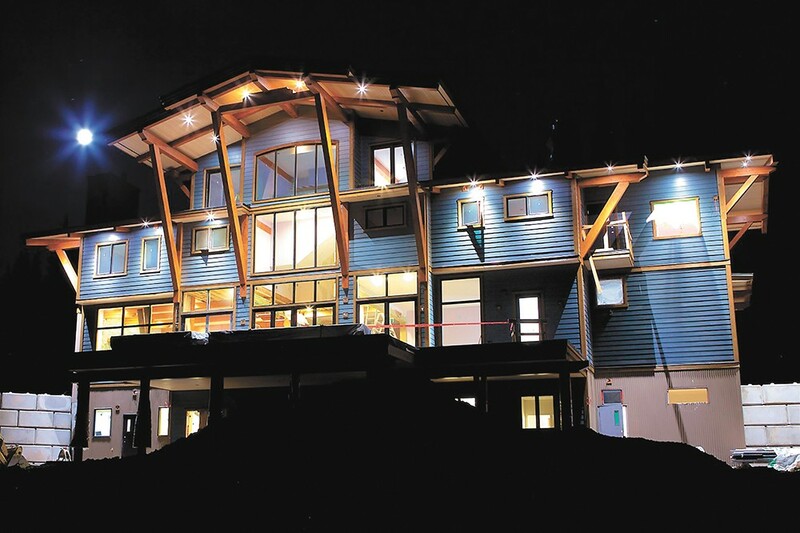 Gostlin Keefer Lake Lodge shares their large tenure with longtime friends Tim Shanks and Matt Devlin of Kingfisher Heliskiing: "The entire tenure that Kingfisher Heli and Keefer have is about 124,000 hectares [nearly 480 square miles]. Of that tenure, Kingfisher uses the outer portion of it, and for Keefer Lake, we are catskiing about 36,000 hectares [about 140 square miles] in the interior part of it that centers right around Keefer Lake," says Jeff. They have terrain for all abilities, according to Jeff: "It's mostly open trees, some pretty nice glade skiing, mostly sub-alpine skiing, and the peak of our mountains is about 2,200 meters tall and we ski right down to 1,400 meters. The terrain is a mixed bag of everything — we've got some really nice, easy skiing for those who don't have a lot of experience with powder, and there's some really good intermediate skiing in the Mail Bowl, off of Mt. Yeoward. The back side of the Dome has got some really nice advanced steep lines, about 2,500- to 3,000-vertical-foot runs that are north-facing, and really good steep chutes, and if you like tree skiing, we have some incredible gladed tree runs." "It's like you're in an old-growth forest, there's moss hanging everywhere, It's just such an enchanted feeling when you're in the woods," says professional freeskier Essex Prescott from Coeur d'Alene. "The tree skiing here is awesome." My daughter, Hannah, was impressed with the 15-passenger snowcat: "Between the short cat rides back up to the top and the scenery, it seems like you're back at it, doing what you love, fast." "The terrain was great. There's plenty of opportunity to challenge yourself. There's big cliffs if you want them. There's trees if you want them. There's steeps if you want them. Awesome terrain," says Coeur d'Alene graphic artist Jeremy Deming. To learn more, visit keeferlakelodge.com.